Why not start the new year with an ad for your business that will bring in new customers. Yes, there may be many give aways out there. But, when it comes having something everyone uses, you should be the one to give it away. Now as I mentioned before, gas prices may be down. But Everyone loves FREE! No matter what. And why not be the business that will give away FREE Gas. Or, maybe you want to be the one that gives away FREE Groceries. Groceries are always up and down in price. I know lots of people, like myself are always clipping coupons. So if you are already purchasing food at your favorite grocery store, then why not have the opportunity to get a rebate. I know that with my other business, I give away Free Groceries with membership. And I already have other businesses that are doing the same. You can use these certificates all across the U.S., Canada and Puerto Rico. Maybe you have a business that can use these certificates. Maybe you are the first in your area to do so. And since money tends to be a bit tight now. This is the perfect time to say look what I have to offer. FREE Gas or Groceries. And watch your business grow. I wish you a Prosperous New Year! Wouldn’t it be great that every time you purchased something you can get money back. And there are lots of opportunities out there that offers those incentives. Now most of the time you have to find those offers. Or they can be in your newspaper every Sunday in the form of coupons and ads. As a consumer that is great. Many people use gift cards as an incentive or just to say Thank You. But when you purchase those gift cards for stores or resturaunts; you pay the full amount. You may as well just hand that person cash. But what if you had the opportunity yourself to offer incentives too. You can; if you own your own business. Whether you have a storefront or homebased business; you too can offer incentives. I found this great opportunity that not only do I get to show business owners how to use this fantastic incentive, to increase their business. I get to use these for myself. So, instead of paying that full price for a gas card or any other gift card, you can offer certificates that are in the denominations of $50, $100, $150, $250, $300, $450 & $500 for less. Please go to my website www.yougetagift.com for more info and to fill out the contact form. 2. Restaurants: This works well with a valued customer reward program. 3. Banks: You can offer free gas or groceries when you open an new account. 4. Hotels: You can offer free gas or groceries with a few night stay. 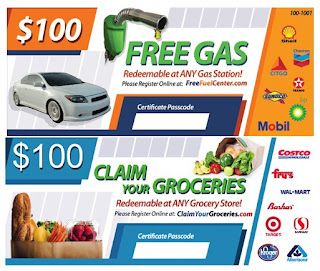 Who else benefits by giving away Gas & Grocery Certificates? This is what the Gas certificate looks like. You can get them in denominations of 50, 100, 150, 250, 300, 450, and 500. If you want to increase your business or just to say thanks, for a referral or to an employee. This is an awesome way to do it. The one who gets a certificate will remember you for a very long time. Now I know that gas has gone down. But Free is Free. No matter what the price, everyone loves FREE. Another great thing to get Free is groceries. Now food tends to go up and down. I'm always clipping coupons to save money. Would you love to get Free Groceries. And when you have certificates to offer, your clients, referrals, employees... They will love you for it. This is a loyalty program, that your favorite grocery store or gas station are a part of. So if you own a business; I would suggest that you get these certificates, to be given out as quickly as possible. If you aren't a business owner; you may want to tell your employer about this blog. Go to my website and watch this 2 minute video. Then fill out the form, so I can contact you on what denomination gas or grocery or both, that will work for you. These certificates are offered in the United States, Canada and Puerto Rico (The certificates are also printed in Spanish). So be the first in your area to advertise this promotion for your business. If you are looking for ideas on how to use these for your business, I will be glad to help you out. Just fill out the form when you go to my website. I will continue with advertising Tips in my next Blog.